Dr. Orphe Divounguy is the chief economist at the Illinois Policy Institute. In this role, he produces original quantitative research analyzing the impact of various policies on the lives of the people of Illinois. Divounguy earned a Ph.D. from England’s University of Southampton. After receiving his Ph.D., Divounguy served as a teaching and research fellow. He also worked as an international economic consultant. His research focused on tax policy, labor policy, migration policy and economic development. 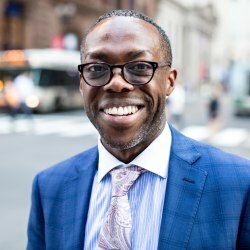 Before his time in higher education, Divounguy interned at the United Nations Department of Economic and Social Affairs in New York, and Cato Institute in Washington, D.C.